The study as part a PhD degree set out to investigate how mobile and social media affordances could be used to design and facilitate a learning experience that was learner-driven and determined—student-centred learning. In collaboration with a group of lecturers, a course was designed and facilitated, and data were collected from students over two years in two iterative cycles of implementation. This report outlines the findings from the research that this data informed, which helped understand how a learner-centred and determined learning could be designed in a formal university course. Before presenting the findings, I would like to thank all the students and lecturers who took part in the study—thanks for your time and for sharing your view and opinion in the research. Your contribution played a vital role in the process, in fact without your cooperation, support and generosity this study would not have been possible. Thank you! A special thanks to Dr Verica Rupar for allowing me to undertake this study in collaboration with her and the team—thanks for your support and kindness in the journey. This study certainly would not have eventuated if it had not been for your cooperation, guidance and leadership. The figure below provides an overview of the learning environment created using the draft design principles which were derived from key frameworks, such as authentic learning, Pedagogy 2.0, heutagogy and mobile learning. 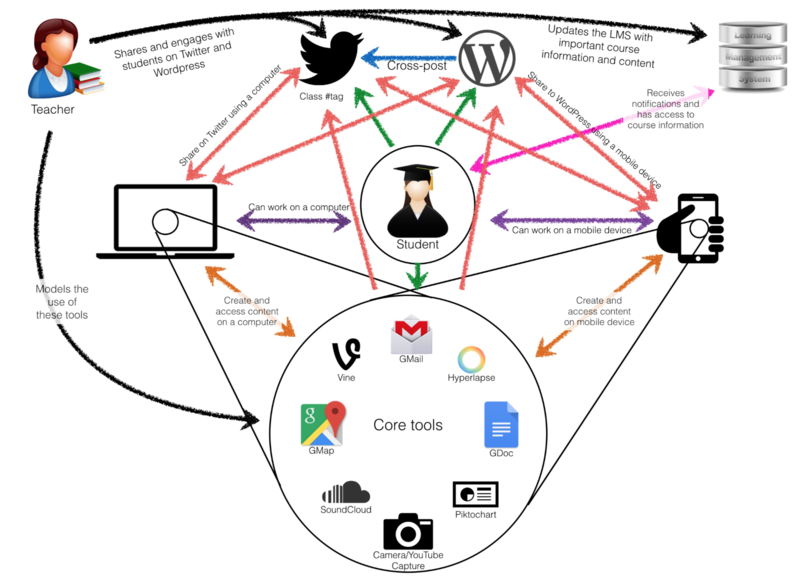 The data collected over two iterations from students allowed the researcher to investigate and understand the role mobile and social media tools could play in student-drive and determined learning (heutagogic learning) and teaching process. The findings from the study are summarised below. The use of mobile and social media tools in the course was found to have enabled participation, personalised and productivity—helping the students achieve ownership and autonomy in their learning. The findings suggest that the students were able to participate with the teacher, peers, experts, members of the public and people from around the world to inform their learning and create knowledge. The tools allowed the students to engage with existing communities online, while also allowing the students to create their own communities for learning purpose. The tools also allowed the students to have a personal or self-determined path to learning—meaning the students were able to direct and determine the resources and support that they thought were useful for their learning. The student’s ability to participate and personalise learning helped them engage in creating content as part of the learning process. Typically, students in classrooms and in learning and teaching are stationed as receivers of content and knowledge from the teacher. The findings suggest that the student’s ability to participate and personalise allowed them to flip this process where they became active participants and creator of content in the course—creating increased opportunity for the students to apply the knowledge they were learning as a professional they were learning to become—a journalist. The tools and the design of the course also allowed students increased access to information and people—allowing students to build and create genuine connections and network for use in their learning and for the future. A particular finding in the research was how the mobility of student-owned mobile devices informed their learning. The findings suggest that the mobile devices and the social media tools that were incorporated in the course helped students create and learn in meaningful contexts (surrounding). This had a positive impact on their learning, as it allowed the students to apply their knowledge and skills in new and meaningful surrounding—helping them build new knowledge and added to their ability to learn to become a journalist. The mobility of student-owned phones, in particular, allowed students to learn from unforeseen or unplanned events and scenarios—for example, an accident on the road, fire, protest, etc. It also allowed the students to learn in genuine social contexts—which provided a challenge and demanded that the students step out of their comfort zone. The findings suggest that this played a critical role in student’s learning, as it questioned their ethical and personal values and also allowed them to form an understanding of their own self—further helping them learn to become a journalist. Student-owned mobile devices and social media tools that were integrated into the course helped the students learn by allowing them to conduct and explore with their ideas and concepts in new and meaningful contexts—for example, taking a picture, video or creating multimedia content. This helped the students understand and build on their current knowledge and provided opportunities for reflection on their learning—helping build competency and capability. The social surroundings the students worked in to create their story accompanied by your mobile and social media tools also acted as a teacher in the learning process. The findings of the study suggest that because students were creating multimedia content in authentic contexts they were able to immerse themselves in the story they were writing—this enabled reflection either on the spot or at a later stage. This helped them identify issues or elements that needed further investigation or suggested that they needed more information to clarify their own understanding. The mobile devices and social media tools allowed the students to go back to the surrounding or context to manipulate it either by engaging with entities (people or other artefacts) or creating more content in order to fill the gap or improve their understanding. These roles were identified from the data that were collected from students over two years. In summary, the findings suggest that the teachers had to be versatile in facilitating the learning. This meant the teachers needed to be aware of what the students were doing, assess their learning needs and, support and adopt a role to facilitate meaningful learning by collaborating with the students and by providing critical feedback on their performance. The mobile and social media tools in the course provided the teachers with a platform and mechanism to be involved in students’ learning as a guide and collaborator and provided them with the affordances to be able to collaborate, provide feedback and validate their work in real time. Along with this, the study also identified that some students were not similar with or had no prior experience of self-driven and determined learning using their mobile devices and social media. In particular, a number of students failed to conceptualise the use of technology and their role in the course for learning. To help remedy these issues, the teachers again acted as ‘change agents’, who utilised several techniques to help students learn, understand and effectively apply the affordances of the tools to inform student learning. An important element according to the findings in the research that played a critical role in helping bridge these gaps was collaboration. The teachers collaborated with the students as a co-learner through social media tools, the course website that was created and face-to-face time in tutorials to help the students form an understanding and build self-driven and determined learning skills. In particular, the course website (or the ecology of resources) that was assembled acted as a platform that encouraged and supported collaboration between the students and the teacher. An important element of the ecology of resources was the creation of students community using a Twitter hashtag. The findings suggest that the community provided the students with an environment where they could practice and learn new skills (learning and technological) in collaboration with peers and teachers—helping build confidence and autonomous learning skills and knowledge. Design learning activities, tasks and a learning environment that encourage elements of learner participation, personalisation and productivity underpinned by the affordances of mobile and social media tools. Facilitate learning using tools that are open, platform independent and learner-owned. Situate learning in authentic contexts chosen by the learner to enable exploration and experimentation. Design formative assessment events that encourage learner participation and reflection in authentic contexts to inform the process of learning to be. Provide support and pedagogical modelling of the use of the mobile and social media tools. The findings from the research are discussed here in summary. If you want to find out more about the study, how data was collected and analysed, and a detailed discussion of the findings refer to the thesis document available here . I would again like to sincerely thank all the participants who took part in this study either directly or indirectly—you all made a difference and added to the findings in the study.